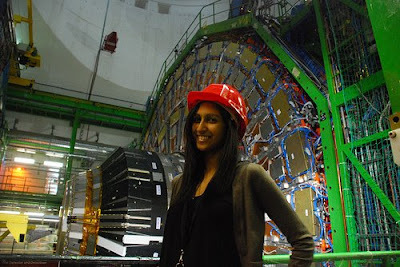 Last week I visited CERN for the very first time where I met the fab GridTalk team as well as the guys from EGEE's NA2. As well as discussing our upcoming translation of GridCafé into French and learning how to film demos for EGEE09 in Barcelona (stay tuned for our GridCast in September) we also went down the LHC shaft on a tour to the CMS detector. CMS uses different layers to detect collision particles, including the muon (hence the name - compact muon solenoid). Massive amounts of data are produced when the experiment's up and running so, as our tour guide reliably informed us, quite a lot of computing power is needed to decide what data should be kept and what should be thrown away. So much in fact that the processors for the CMS trigger system outnumber the total processing power for LHC's predecessor LEP. Although, at 21 m long, 15 m wide and 15 m high, CMS is not as big as ALICE, it does have the benefit of being amazingly colourful and pretty photogenic. See for yourself (plus check out the EGEE and GridTalk teams in rather fetching hardhats) over at Flickr. Nice shot Manisha! Sounds like a fun trip...CMS is looking fab! !